Draft executive Summary and Overview of Hospice Friendly Hospitals programme. 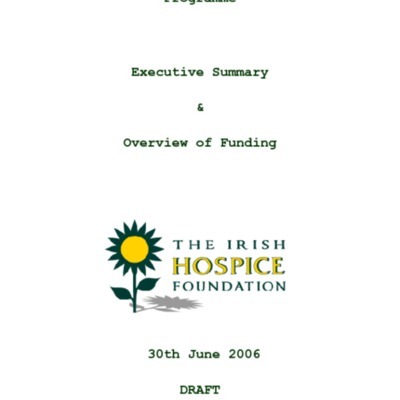 Draft of an executive summary of the Hospice Friendly Hospitals programme and an overview of funding for the programme. Parent Collection: Hospice Friendly Hospitals programme. Executive summary and overview of funding. Irish Hospice Foundation. , “Draft executive Summary and Overview of Hospice Friendly Hospitals programme. ,” Archives Hospice Foundation, accessed April 22, 2019, http://archives.hospicefoundation.ie/document/573.